In an effort to promote immigration reform, tech-back advocacy group FWD.us launched Push4Reform, an app aimed at helping supporters connect with Congress. In an effort to promote immigration reform, advocacy group FWD.us launched Push4Reform, a Web application aimed at helping supporters connect with Congress members and urge them to take action. 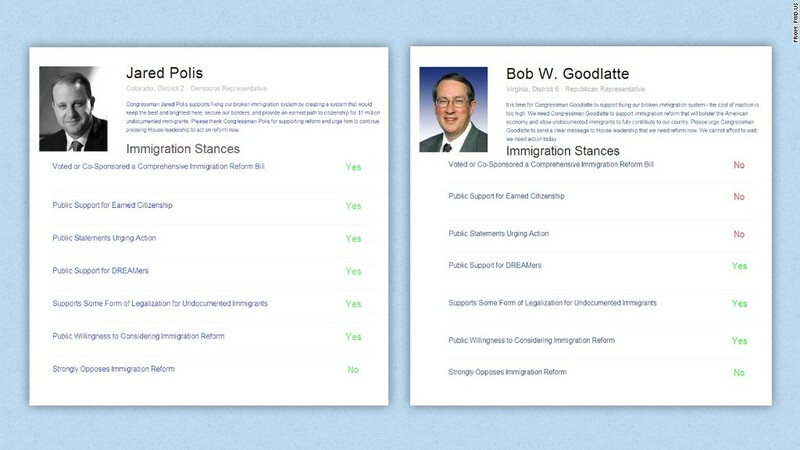 Push4Reform gathers information about members of Congress and their stances on immigration. People who use the app can enter their ZIP code to learn whether their representatives and senators support particular immigration reforms, what their reps have said publicly about the topic and find the best ways to connect with them. The app is a small step in a larger movement by FWD.us, an advocacy group led by Facebook (FB) founder Mark Zuckerberg and entrepreneur Joe Green and supported by numerous Silicon Valley titans. The group lobbies Congress to take action on immigration reform. In November, FWD.us hosted a hackathon with so-called DREAMers -- undocumented immigrants who arrived in the United States as children and remain undocumented. "Who better to communicate immigration reform and build apps than the potential beneficiaries themselves?" Green asked CNNMoney. Twenty tech-skilled undocumented immigrants worked with tech founders like Zuckerberg and LinkedIn (LNKD) co-founder Reid Hoffman to develop apps for the cause. Push4Reform won "Best Advocacy" at the contest. "This product is a great example of the best of tech and the best of Washington coming together," Green says. Entrepreneurs Luis Aguilar, Justino Mora, and Kent Tam created the app. Aguilar, who immigrated from Mexico when he was nine, taught himself to code but was forced to drop out of college due to the out-of-state tuition costs. Mora came to the United States when he was 11 and studies computer science and political science at UCLA. Tam also studied at UCLA and struggled to find a job due to his immigration status. With Congress back in session after the New Year's break, the group is looking to amp up their push to reform. But tech entrepreneurs are often the first to acknowledge the gap between Silicon Valley and and Washington. And Silicon Valley's tech approach to problem-solving isn't always consistent with deep-rooted policy change. Green acknowledges that calling for reform in Washington may take more than code, but the entrepreneur remains optimistic. "I think there is more similarity between the two places, in that they are both driven by big goals and big ideas," he says. "But look, in Silicon Valley if you don't like the way something works, you just go around it. You're not going to go around Congress. Congress is there and you want to try to take a pragmatic approach to getting stuff through."